Drainage composites often refered to as drainage board is a prefabricated drainage composite that can provide positive drainage in a very thin layer. Drainage composites can replace up to 1 foot (300 mm) of drainage gravel in some applications. Unlike drainage gravel, a drainage board can be placed vertically and even suspended overhead to make complex drainage problems much easier to solve. Drainage board is most often used in commercial building applications where positive drainage is required and space is limited. This typically occurs in commercial building foundations, underground parking lots, and tunnels but can also be used for residential applications. The drainage board composite offers excellent water transmissivity in an exceptionally thin layer. This allows designers to maximize available real estate and place building foundations closer to property lines. In applications where property lines require vertical excavations a drainage composite may be the only way to ensure drainage. 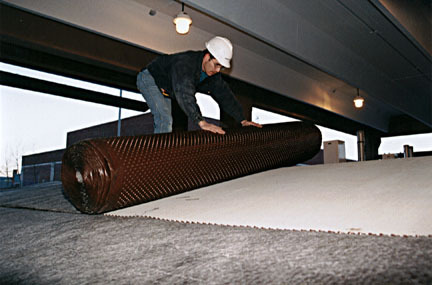 Drainage boards are available with different core strengths and geotextile filters. Geo-Nets are used to provide lateral transmission of fluid in many applications. Geo-Nets provide drainage layers in multiple lining systems. Wick drains are three dimensional drainage structures that drain water in vertical and horizontal applications. H2Ri combines strength with water wicking capabilities for subgrade stabilization of roadways.